I am super excited to formally announce that I'll be a guest participant in this season's One Room Challenge™ which starts RIGHT NOW. Hahah! Get it???! Today, I’m showing you how to use faux succulents from the dollar store to create 5 unique home decor displays that you can’t kill! A note about the Sales Spotlight Series: Each month, I'll round up the best current sales for you to peruse on your Saturday morning. The links in these post are sometimes affiliated (and sometimes not). This means that I may receive a small commission on any direct sales from the post. 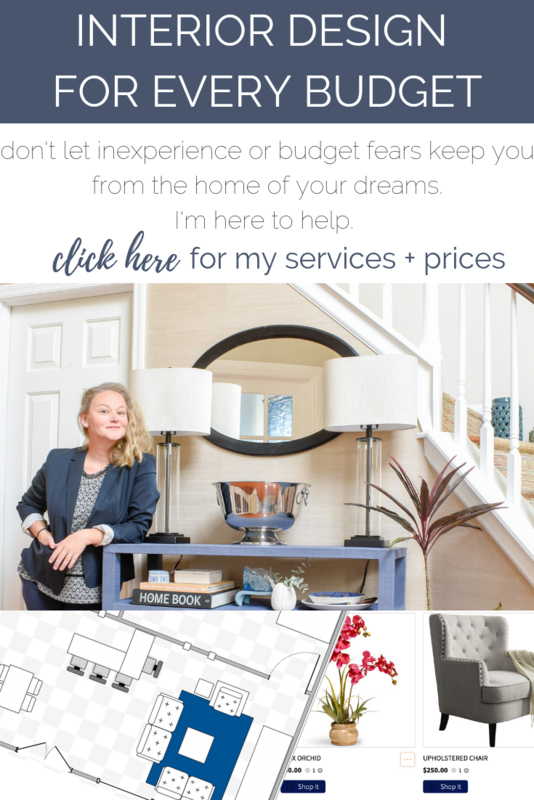 While I do appreciate your purchasing a product directly from my links (because it helps me cover the overhead costs of running this blog), the intention of these posts is to share the best online deals I've come across while sourcing for clients. All of the opinions are my own and have not been influenced by any potential sponsorships or affiliations. Let's save some moolah! I know a lot of people use Houzz for inspirational photos and to find contractors, but did you know they actually sell items directly on the site? Often they have the same items you can find on Amazon or Wayfair and they're actually cheaper. Right now, they're having a President's Day Sale with items discounted up to 80%. There are a ton of good deals. To see them all, click here. 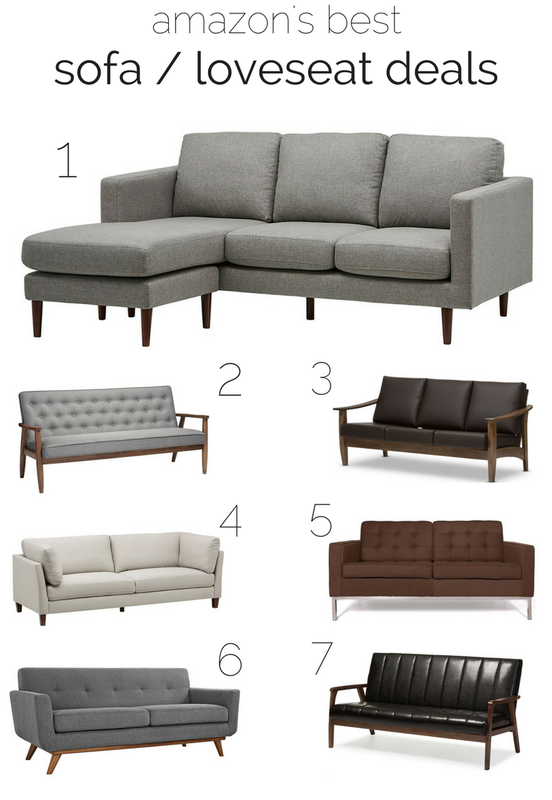 Here are my Top 15 Favorite deals from Houzz. Double click the images to go directly to the item's sale page. I want to see these in a trio above an island or dining table. At this price, you can totally afford to do that. 70% off. I can feel Spring coming on and I want to organize all the things. This is a stellar deal. 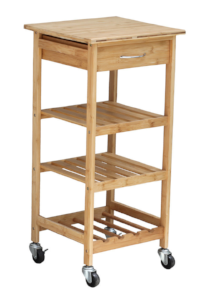 Replace the drawer pull and take the wheels off to use in your bathroom. 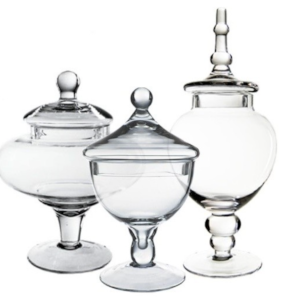 I will never not love apothecary jars. I fill them with cotton balls, fancy soaps, and Q Tips in the bathroom. But I also want to see these with pastel M&Ms for Easter. Or - OH - those tiny little speckled egg candies. Swoon. You know those products that you see for the first time and can't stop wishing you'd been the person who invented it. Yeah. This is that for me. Also, why don't I already own ten of these? My daughter would love to lounge in this and watch TV. In my office. That's her favorite and my office armchair is nowhere near as comfortable as this thing looks. If I were a selfish person, I'd keep this one to myself. It's my favorite thing on this list. I'm buying one. Christine doesn't know yet so shhhhh. Okay. Technically, this is just a hair under 50% off. But oh my it's so cute. I really had to show it to you. I think it's a great deal and please send me your photos when they are delivered so I can drool. I am not making this up. 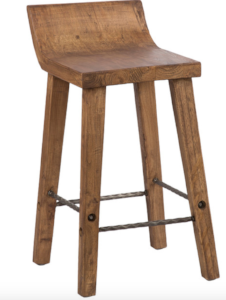 I pinned a very high-end kitchen renovation yesterday that had these exact stools. Or they're a very good knock-off. Either way, I wish I had an eat-in counter for these. I can't decide which one I like more. Ugh. They're half off. Buy them both. I spent three years trying to find this exact shelf at an afforable price for my last house. And you've just been served it up on a silver (gold?) platter. You're welcome. I'm really in an organizing mood right now. I've been googling contact paper a lot lately. This is cute. You should put it by the door in your garage to keep people from tracking in all that nasty outside stuff. Sit down. Take your shoes off. This is a really. good. deal. This chair will never go out of style. Ever. Even long after the Farmhouse Modern craze has ended, this chair will be renamed and will continue to be sold at extremely high prices. Here's another item I don't think will ever trend out. And this is a stellar bargain. This is what President's Day sales are all about, so I'd be remiss not to mention one mattress sale. And this one's the best I found on the whole site. I love the modern shape of the globe juxtposed against the kind of schoolhouse electric, vintage-y stem kit. Very chic. So that concludes the Top 15 items from Houzz's President's Day sale. To see all of the items on sale, go here. If you just can't get enough sales posts, head over to Chris Loves Julia for their Saturday Sales post. It's weekly. And it covers everything. - fashion, home, everything. I'm going to keep posting these every fourth Saturday. So if you have any suggestions, please let me know. Send me a DM on Instagram to let me know if you think I should cover more items (there were like 100 I really wanted to show you) or less. Or let me know if you'd prefer more descriptions or less talky talk. I really want to know. You can also comment below. Wow. Amazon Sells Furniture and It Does Not Disappoint. The following post may contain affiliate links. As an Affiliate Marketing Associate I earn commissions from qualifying purchases. This helps me keep the content coming, so thanks for your support! Did you know that? I had no idea. I mean, of course, I guess in the back of my mind I assumed they did because once I saw a screenshot someone took of a canister of Uranium being sold on Amazon (I don't remember the price, but I do recall it was cheap because I did consider buying it just to say I did that once). So clearly, Amazon has everything. I just hadn't really given it any real thought until I got a promotional email a few days ago about an extra 15% off furniture purchases for Prime members. So I decided to check it out and YEP they sure have furniture. Like most everything else on Amazon, the Furniture section is a disaster. Let's be honest, unless you go there for a specific product, Amazon is challenging to navigate. There's just too much. And it's hard to decipher between what is an advertisement for another website and what is an actual product I can receive if I send them all my money. I really love that sofa with the chaise! It's 80" long. That's like a real sofa size, you guys. Double check all of the measurements before you order to make sure it's going to fit your space, but I'm telling you - that's not a crappy dorm "sofa". I also pinned some awesome armchairs, but this post has gotten too long. 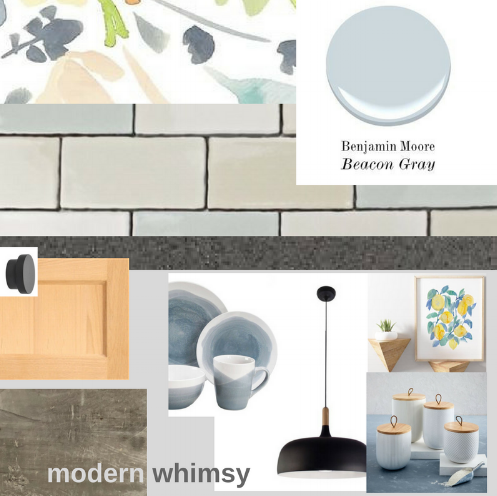 I'm going to come back with some armchair finds and maybe some cool modern decor finds, too. ready for the home you love? 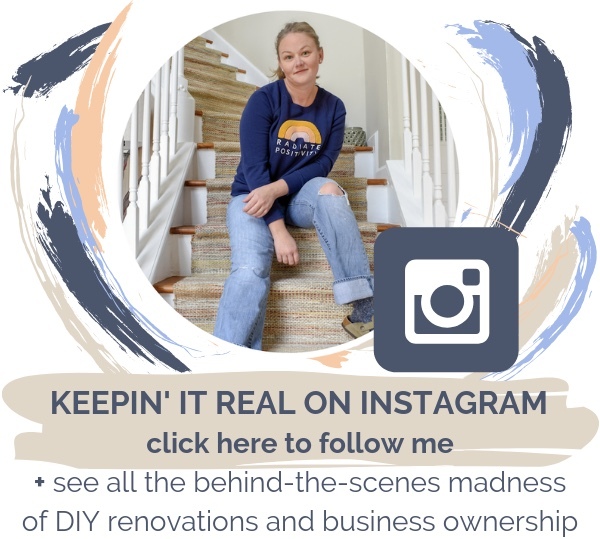 Sign up to receive access to a FREE library of DIY home remodeling and decorating resources. Remember that powder room that I picked apart a couple of weeks ago? 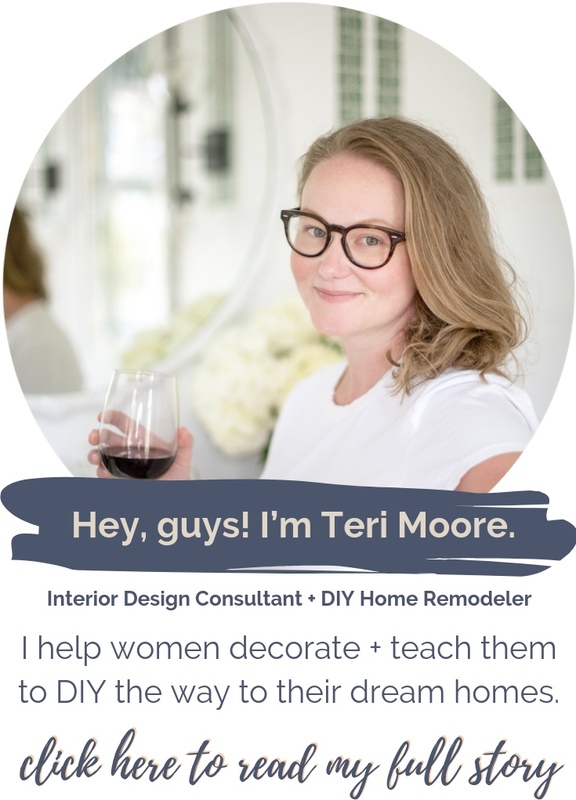 If you don't recall, here's the post about staging a powder room for resale. Here's a refresher picture. Confession: That's my powder room. Well, it WAS my powder room. But now, THIS is my powder room. 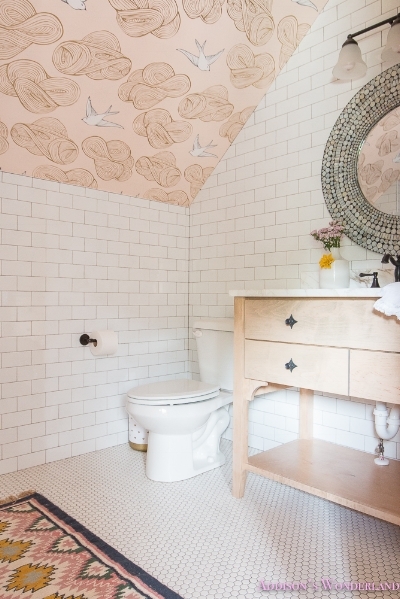 I have to admit, I got every bit of inspiration for this powder room from that wallpaper. Sourcing a navy grasscloth, I accidentally ordered a sample of this last summer. It sat on my desk for a really, really long time. I would just stare at it. I fall in love very easily, especially with home decor. But this was a little much for even me. I mean, I really obsessed. Eventually, I taped it to the wall in the powder room and just left it there for months, hoping it would grow on Christine. the view from my office. I mean, I just. Here's my view from my office. I've always kept that door closed because my webcam faces the French doors. Now I can't wait to fling those doors open on all of my Skype calls! no longer embarrassed to have a toilet in my foyer! I SPEND TOO MUCH TIME ON INSTAGRAM. 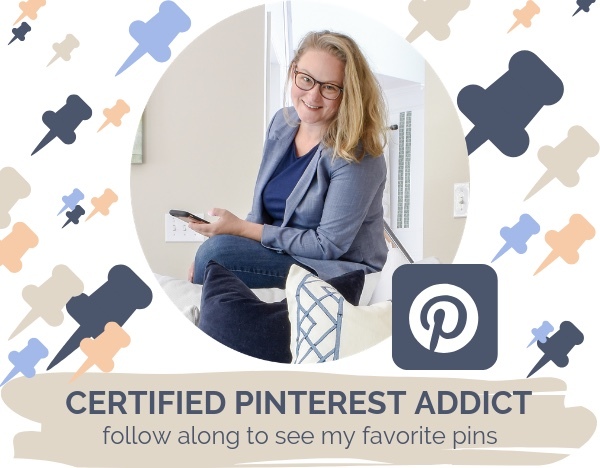 CLICK AN IMAGE BELOW TO FOLLOW ME AND SEE WHAT I'M UP TO. Yoo-hoo! Quick Sale Post! 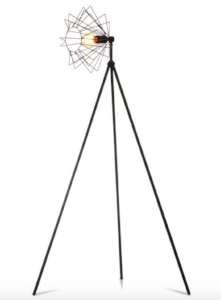 $86 Capiz Shell Chandelier Alert! Just dropping in unscheduled to let you all know I've eyed the very same chandelier I have installed in my dining room on a MAJOR CLEARANCE right now. It was originally already a great bargain, since it was approximately $150 less expensive than the West Elm version I've always loved. And it's not cheap looking at all. It's really beautiful in person and was so simple to install. Go buy it before everyone else does. Here. *Post may contain affiliate links. Prices are subject to change, based on current sales. LOOKING FOR SOMETHING SPECIFIC? TYPE YOUR KEYWORDS INTO THE SEARCH BAR BELOW. This blog contains affiliate links, sponsored posts, and personalized banner ads. This means I may receive payment from the products sold and promoted through my site. 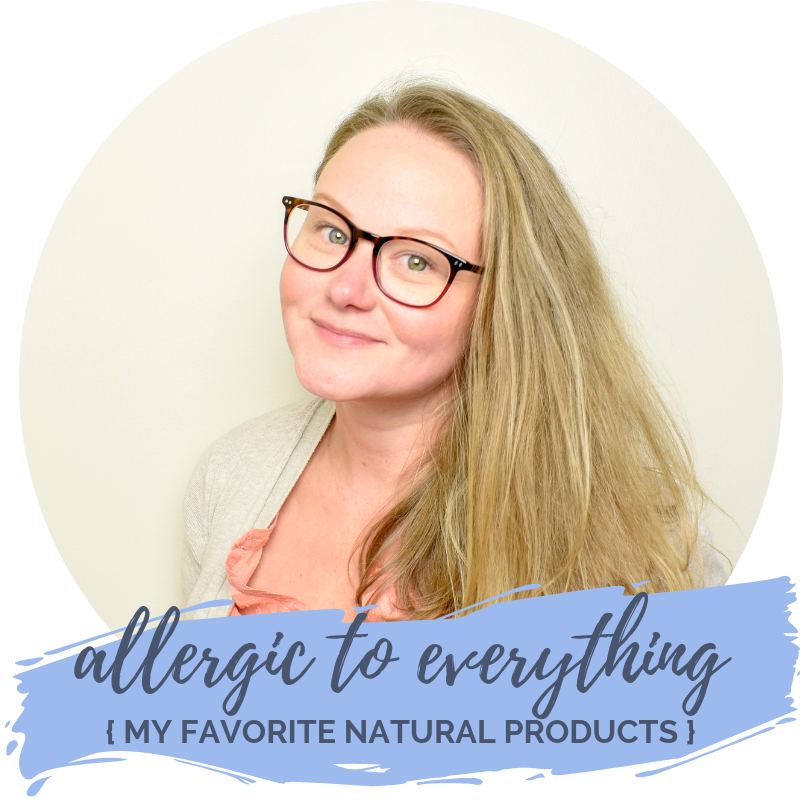 Any product opinions list are PURELY MY OWN and are not controlled by any affiliate programs or sponsorships.